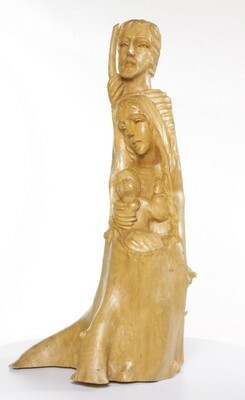 1 piece carved wood statue of Joseph, Mary, and baby Jesus, presumably created in the 20th century. The Child nestles deeply into Mary's lap, his right hand over his heart, Mary's hand over his. His left hand seems raised in greeting or in blessing, usually not given with the left hand. Mary is seated; Joseph stands close guard. The postures indicate the nativity scene -- adoration of the many visitors. The oneness of Mary and Joseph in the solemn task to guard this Child is evident. The artist has made fine use of a driftwood root leaving intact its natural features, particularly in back. The Incarnation happens in a family setting, the most basic natural configuration of this world.